Be aware: this is an extremely challenging game! Exercise concentration and reflexes while playing a game! The average human can hold between 5 and 9 chunks of information at a time... well, get ready to challenge that! can you hold all 9? how about 10?! and 20?! Help the balls bounce its way to the goal. By tapping on a destination station the ball is able to bounce to the next station. You may also rescue a ball that is stranded in a station but hurry! it won't last much! Sounds easy? Is not! as station start appearing and balls continue to come out faster with more and more speed... well, things get 2Dotty! 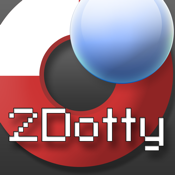 2Dotty is an excellent brain tuner. Make sure to test your reflexes and your concentration, your unconscious intuition and your patience! Find your own strategy to move all balls to the goal and unlock the next level. The game is packed with 20 Levels on each Game Mode for a total of 60 levels. ** Classic - Single player. As levels advance they become insanely difficult! ** Team - Play with a friend. Discover new levels with special station distributions. ** Versus - Play against a friend. See who makes the highest score. This mode is specially challenging because you are able to launch the balls at your will. It can mean a higher score to you, but it will mean also a higher difficulty. This game is the ultimate focus, reflexes, and mental map retention trainer. Let the force guide you! Remember you can challenge your friends with the Versus mode or play together as a Team to unlock new levels! Hope you enjoy playing this game and stay tuned. More things will be added with your support!